Summary: How long does it take to travel 13 light-years to Earth? How long does it take to fall in love? To the universe, eight days is a mere blip—but to Matty Jones, it may be just enough time to change his life. On the hot summer day Matty’s dad leaves for good, a strange girl suddenly appears in the empty field next to the Jones farm—the very field in rural Pennsylvania where a spaceship supposedly landed fifty years ago. She is uniquely beautiful, sweet, and smart, and she tells Matty she’s waiting for her spaceship to return to pick her up. Of course she is. Matty has heard all the impossible UFO stories for all of his seventeen years: the conspiracy theories, the wild rumors, the crazy belief in life beyond the stars. As a kid, he searched the skies with his dad and studied the constellations. But all that is behind him now. Dad’s gone and Matty’s stuck. But now there is Priya. The self-proclaimed alien girl. She must be crazy or high, right? As Matty unravels the mystery of Priya, he realizes there is far more to her than he first imagined. Matthew Jones is a rather generic high school student at first glance. He doesn’t have many redeeming qualities, as he mostly messes around with his friend instead of studying, and he lives in a rural town. However, his peaceful existence is turned upside down when his father runs off with his aunt, leaving his mother behind. Suddenly, Matthew feels a void in his life, and on top of this, a strange girl appears in the field next to his home. Her name is Priya, and she claims she is from a similar planet with the objective of studying Earth. As Matthew shows Priya around the strange dustball known as Earth, he begins to realize the value of his own life. However, just as he befriends this strange alien creature, she begins to expect to leave soon. Matthew must deal with conflicting emotions and understand what he really wants. Eight Days on Planet Earth is a fairly generic love story set on the backdrop of space and science. What makes this book rather unique is that Matthew is authentic; he does not feel forced at all or unimaginably perfect either. Still, for those who want a deeper and more critical novel, I would say to stay away from this, as it is caught in the unfortunate trap of being a young adult novel. However, for those who wish to read another love story, this is your cup of tea. 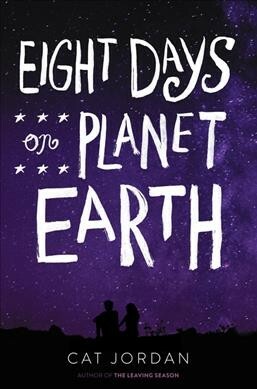 Eight Days on Planet Earth is a solid, if generic, book for those who wish for a sappy romance story. 3/5 stars.